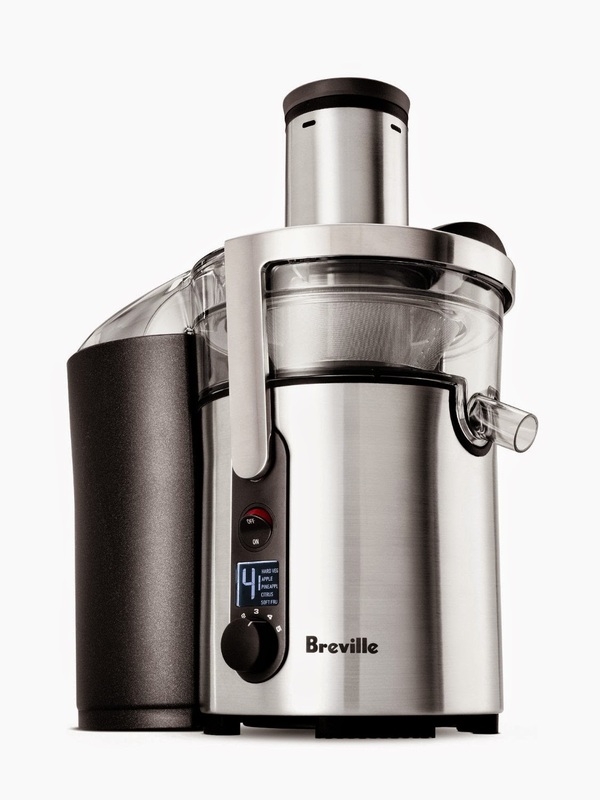 The Breville BJE510XL is a stainless steel fruit juice extractor powered with 900 watts. This product operates with a five speed variables within the range of 6,500 up to 12,500 RPM (revolutions per minute) with a circular feed tube measuring 3 inches. Accessories and other features include a fruit and juice froth separator, a sprout that is detachable, an engineering high grade polymer, and a backlit display control panel. The item measures 16 4/5 by 15 1/2 by 10 1/4 inches with a 1 year limited manufacturer warranty. The Breville Ikon provides varying speed to make it easier to extract and juice between soft and dense fruits and vegetables. The minimum setting at 6500 RPM is enough for soft fruits and leafy vegetables. The maximum setting on the other hand is best for dense items such as apples and carrots. The circular feed tube allows juicing and extracting of items without the need to peel, slice, or cut them first. It is strategically positioned almost on top of cutting disk. This provides better balance and performance from the product. Maintaining the item is very easy. All parts are made of detachable plastic and are dishwasher safe. Its micromesh filter ensures that the juice stays in while the fibers keep out, making it easier to clean. It doesn’t stain as well even with the acrylic pitcher as long as you clean immediately after use. A brush is included for cleaning purposes too upon purchase of the product. Made of a stylish and sturdy stainless steel material from the casing to the blades, the Breville BJE510XL is expected to last for years. The motor will not burn out even when regularly used unlike other juicer/extractor products. This product can be considered as one of the most efficient among fruit juice extractors. It can extract a fruit and make juice in as fast as 5 to 8 seconds only. For those who are not a fan of froth, its froth and juice separator will make sure you pour only the juice and not the froth into your glass. A powerful motor embedded with a smart chip automatically increases power during a heavy load of items or when denser items are feed in. The backlit display even shows a guide when choosing between different speeds. The Breville Ikon is a very effective and time efficient juicer and extractor. The feed tube is large enough to accommodate whole food items without the need to cut or slice them. It operates quietly and can be considered as one of the quietest fruit juice extractors offered in the market today. Although the plastic parts were designed for easier cleaning, some customers may prefer an all metal finish. It is also quiet heavy and may be inconvenient to wash when using a small sink and not a washer. The most notable review of the product is from the Choice Magazine from Australia. The magazine can be compared to the ranks of ConsumerReports.org in the U.S. The magazine tried and tested 17 juicers and awarded the Breville BJE510XL as the runaway winner. A number of home consumers also attest to the effectiveness of this fruit juice extractor. It is also very easy to setup according to many. Just connect the parts and pieces together and in seconds, you are ready to juice. Get the Breville BJE510XL Juice Fountain Multi-Speed 900-Watt Juicer here!